Change is in the air. We anticipate renewal as we observe the seasons change from winter’s snow that left behind dead leaves to the beginning of new life as green plants spring up. Change and renewal are part of not only nature’s rhythm, but the rhythm of our lives. One could say that if we aren't changing in some way, then we are dead. If we are still alive, then transformation occurs both naturally in our physical bodies and spiritually in our hearts. We transform during the journey beginning with our first breath all the way until our last. The first signs of spring offer us a glimpse into our own gradual transformation. Soon the fullness of the sun envelops our landscape and fresh life appears. However, before that there are great opportunities to learn during the winter seasons, although we would rather skip right over most if we could. If we hypothetically skipped from fall to spring we might stay tan, but we would miss the true process of beneficial change. Historically, the Christian metaphor for this renewal was Jesus’ own resurrection. New life sprang out of the grave when He rose from the dead. But notice that new life could not come without death and burial. Or, as Richard Rohr states when he refers to holy week, “One cannot just jump from Friday to Sunday in this case, there must be Saturday!” There is no “jump[ing] from Friday to Sunday,” but the question is: What then is Saturday? Most Americans want change to be instantaneous, like microwave popcorn, quick and no mess! But change is a process and it is messy. Think of any remodeling project (major or minor). First one must make a substantial mess before transformation can occur. Spiritual change is the slow death of our false self. Our egos must die and be buried. Saturday then becomes the key to our own transformation. Some call the day that Jesus was in the tomb, “liminal space.” Liminal space is that time between death and resurrection. In our own lives it allows us to hold on to our pain long enough to examine ourselves and know deep down that transformation is vital. There isn’t much we can do (or undo) about our past hurts and failures. All we can do is hold on to our wounds until they teach us new lessons about ourselves and the world around us. That may sound scary when life deals a hard blow. But if we are able to hold on to the pain long enough without trying to simply numb it with pills or other vices, we can learn valuable lessons. We too can come out of the grave, where we once were on Saturday, and rejoice in the new life that sprang out. At the very least we have more compassion when it is time to support a friend or neighbor in need. Please allow me to encourage you not to run too fast from your trials. Instead embrace Saturday’s hard lessons, and watch new life emerge out of the grave on Sunday. As Psalm 23 reminds us, at times we might be in the valley of the shadow of death, feeling alone and afraid. But Christ IS there beside us, gently leading us through to the other side, where green grass and fresh water await. Resurrection isn’t just a doctrine, it is a reality happening all around us. As we eagerly await Resurrection Sunday, may we jump into our transformation with both feet, anticipating the renewal Christ brings in our lives. 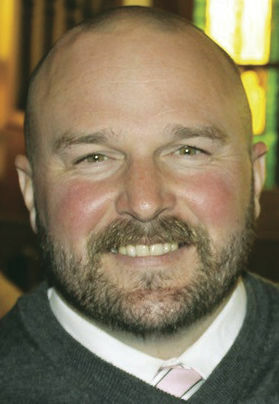 Justin Dryden serves United Congregational Church of Butte.